After Gally leaves, Thomas feels fear that Gally wants him dead. Minho says they should throw Gally in the Slammer, the Glade’s jail, for threatening Thomas. To Minho’s surprise, Winston says that maybe Gally has a point about being worried about Thomas. Tired of being talked about like he’s not there, Thomas finally speaks up. Thomas says that he only broke the rule because not doing so would have meant that he would have had to turn his back on two people who needed his help. In the same way that Thomas’ hope was contagious in the Maze, fear spreads from Gally to Winston. In the Glade, fear of disorder keeps the Gladers from changing their flawed attempts at escaping the Maze. To change their views, Thomas argues that since rules are fallible, people must be willing to break or change them in order to protect the lives of others. If Thomas can convince them of the importance of change, then perhaps he can get them to alter how they approach solving the Maze. Newt proposes that they throw Thomas in the Slammer for one day and then let him start training for being a Keeper. If he proves himself, they’ll make him the Keeper of the Runners in a month. The Keepers vote and Newt’s proposal passes. Chuck runs into the hall after everyone’s left except Minho and Thomas. Chuck tells Thomas that Alby is asking for him. Newt’s decision to throw Thomas in jail is purely symbolic. Not wanting to neglect the strict system of laws and punishments, Newt feels he must do something to show the Gladers that, no matter what, breaking the rules will get you punished. Plaue, Ethan. "The Maze Runner Chapter 26." LitCharts. LitCharts LLC, 22 Jul 2015. Web. 23 Apr 2019. Plaue, Ethan. "The Maze Runner Chapter 26." LitCharts LLC, July 22, 2015. 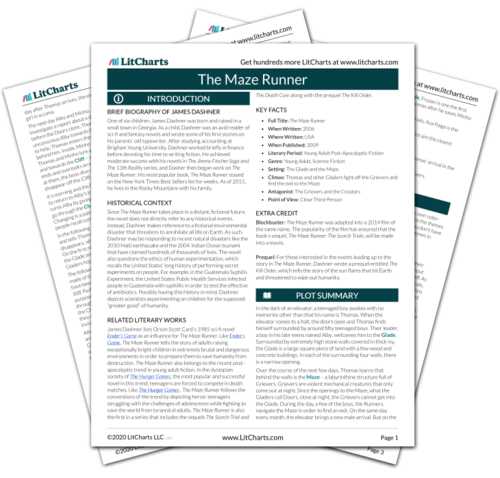 Retrieved April 23, 2019. https://www.litcharts.com/lit/the-maze-runner/chapter-26.